Launch - The Chip's Challenge Wiki - The Chip's Challenge Database that anyone can edit! 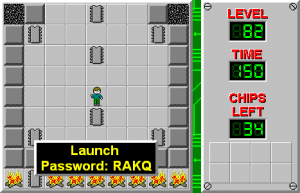 Launch is the 82nd level in Chip's Challenge Level Pack 1. It was created by Zane Kuecks. This level's theme and design is heavily inspired by the map of the same name from the game Call of Duty: Black Ops. A slightly modified version of this level titled Launch 3.0 was ported to Chuck's Challenge 3D, where it was soon selected as Puzzle of the Week.